Born January 1, 1924 in Waterloo, IA and died August 2, 2016 in Waverly, IA. Dale Claude Jung joined the United States Marine Corps August 20, 1942 in Waterloo, IA, served during the World War II era and reached the rank of TSGT before being discharged February 5, 1946 in Great Lakes, IL. Dale Claude Jung, 92, of Waverly, Iowa, passed away on Tuesday, August 2, 2016, at Bartels Lutheran Retirement Community in Waverly. Dale was born on January 1, 1924, in Waterloo, Iowa, the son of Ernest Claude and Zazel Annetta (Moss) Jung. He attended school in Waterloo, Iowa, and graduated from West High School in 1942. In August of 1942, Dale entered the Unites States Marine Corp. and served in the South Pacific Theatre until his honorable discharge in February of 1946. On August 11, 1946, Dale was united in marriage to Donna Nadine Sommer in Waterloo, Iowa. The couple made their home in Waterloo, until relocating to Waverly in 1959. Dale worked as a Systems Research Analyst for CUNA Mutual Group. He retired on October 21, 1985. 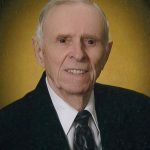 Dale was a charter member of Redeemer Lutheran Church in Waverly, and an active member of the Waverly Lion’s Club and the American Legion. For fun, Dale enjoyed golfing, fishing, and spending time with family. He especially liked to deep sea fish while wintering in Corpus Christi, Texas, with Donna. Dale is survived by his wife, Donna; daughter, Diane (Duane) Harms of Shell Rock, Iowa; son, Daryl Jung of Waverly, Iowa; grandchildren, Dawn (John) Scheneman, and Dana (Jim Robinson) Harms; four great-grandchildren, Andrew, Allie and Evan Scheneman, and Caleb Robinson; two sisters, Harriet Fisk and Phyllis Kirschman; and several nieces and nephews. He was preceded in death by his parents, and a grandson, Douglas Harms. “Dale Jung Obituary,” Kaiser Corson Funeral Homes, Inc., accessed October 23 , 2016. http://www.kaisercorson.com/obituary/Dale-Claude-Jung/Waverly-IA/1643338. Release Date: August 2, 2079.